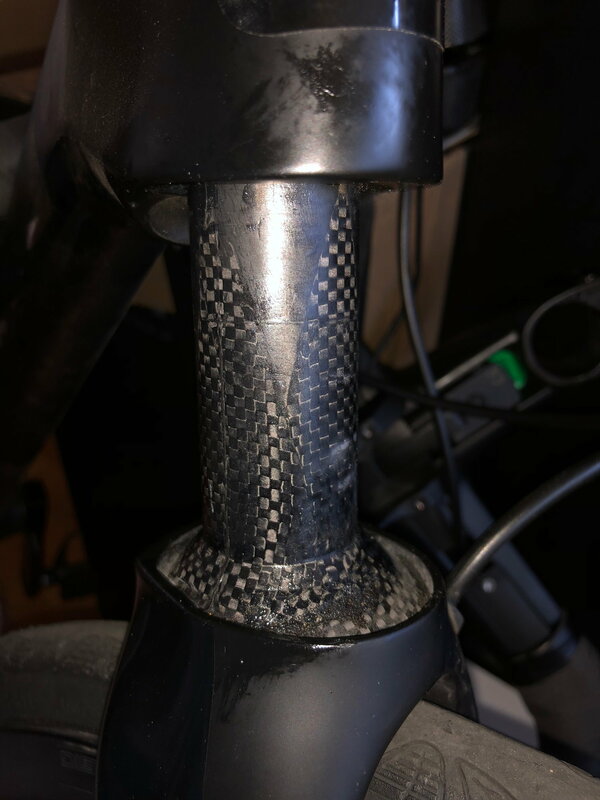 Ride with a loose headset: risk of some dangerous? I rode some km (maybe 10-15) with a loose headset / with a play in the headset which I now fixed correctly. The headset was just a very little loose in direction front/back. 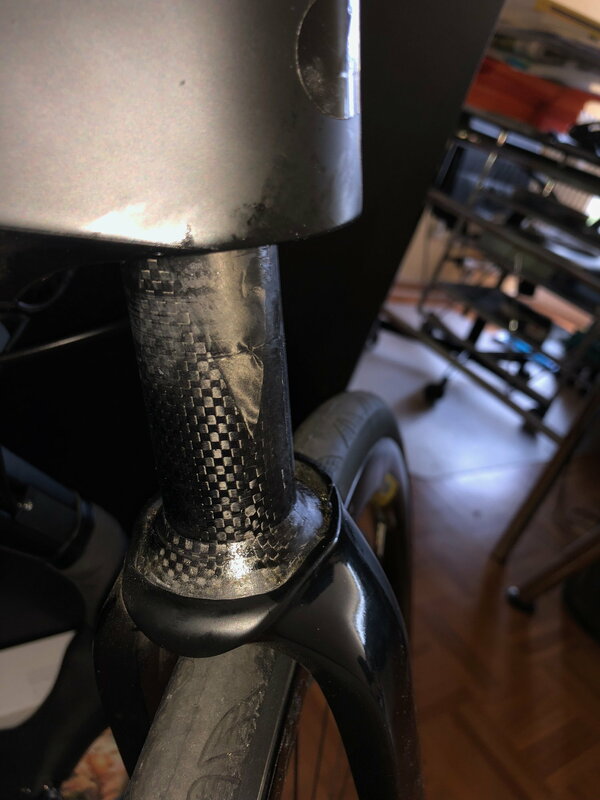 Now, I have fear that I damaged in this way something, for example: the carbon-fork or the headtube because of the play. What do you think about this? 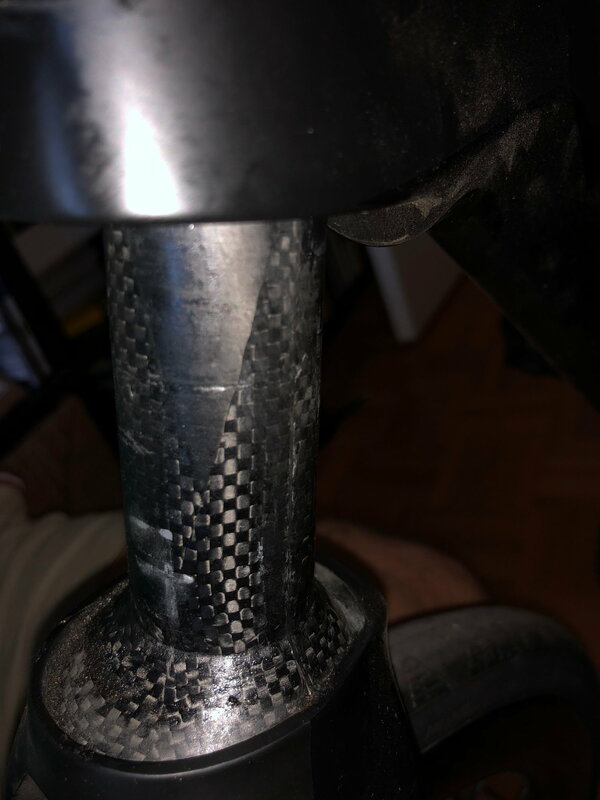 Do I have now to change the carbon-fork with a new one? Last edited by alexva12; 08-13-18 at 12:03 AM. Bikes: Too many. Cannondale SuperSix, Trek Remedy 8, Trek Crossrip+ get the most ride time. Mostly it'll have strange effects on the handling and lower bearing life. It could potentially damage the frame or fork but your example seems very unlikely. I wouldn't worry about it. 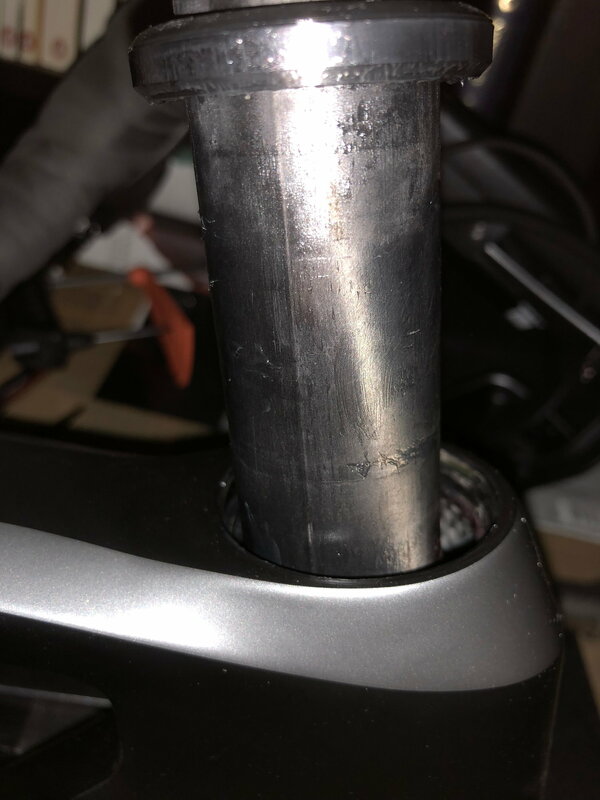 Carefully inspect the head tube around the headset cups for damage. Why was it loose in the first place? Improper service or assembly? It was loose because of an improper assembly. The head tube and the headset cups are visually intact. Then I agree it's probably okay with so few miles on it. Monitor it closely and if it does not loosen up again in the near future, don't worry about it. Maybe have the assembler check it out again, if possible. It's a Canyon, so the assembler is almost certainly the OP. 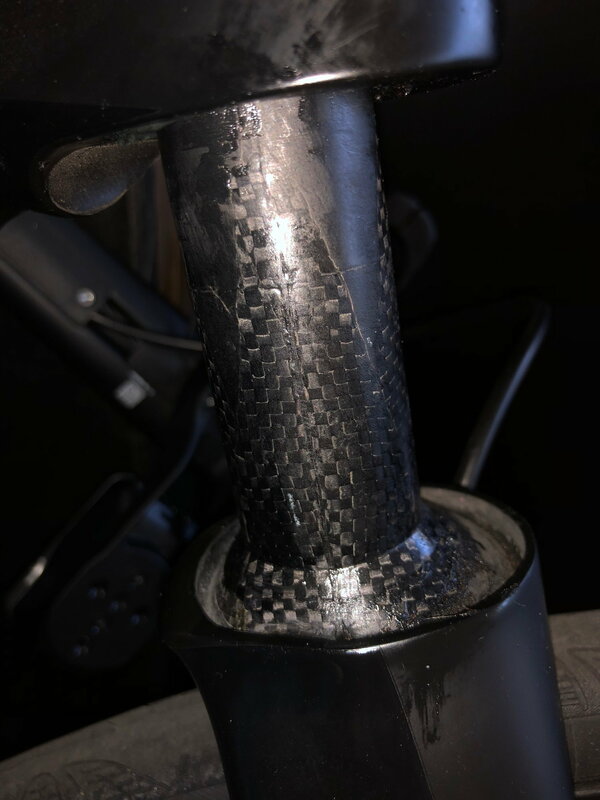 I've seen destroyed carbon head tubes from this, butI don't know how much riding it took. thank you everyone for the reply. This helps me much! Anyway, I forgot to say that the headset is *without* fork crown race (https://imgur.com/a/RvcH4Bq) is this a relevant information for to answer my question? Is the answer the same? Last edited by alexva12; 08-17-18 at 10:46 PM. It's unlikely to change much of anything. Too tight is worse than too loose in my experience because you might not notice it until damage is done. You noticed your loose headset right away and took care of it. Kudos. Thanks, so I will ride the bike without be worried . 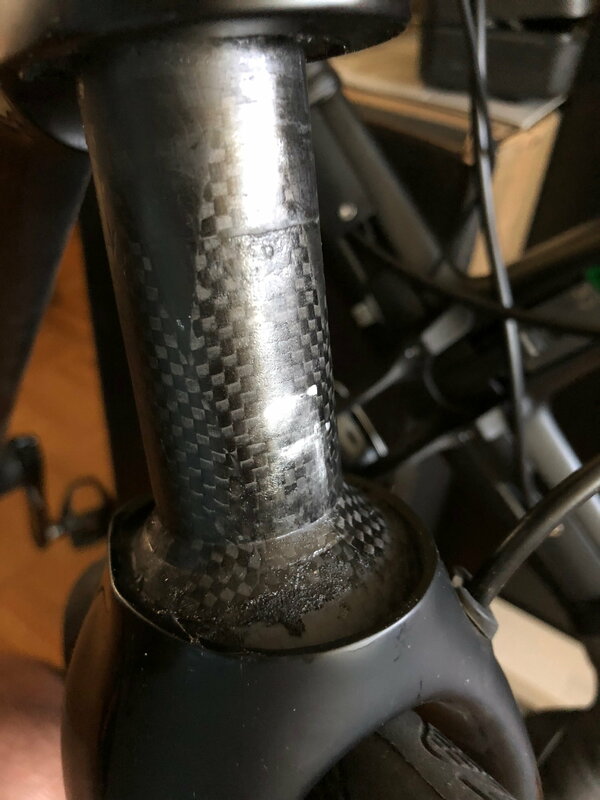 Is it "normal" that the headtube is in such a condition? The cross-sections are not superficial, but rather a bit deep, it can be "scratched", the fingernail "goes a bit in". The same is for some vertical-sections. Those are some pretty decent photos: I'd email them to Canyon. To me it looks like an artifact of the molding and probably no big deal, but don't hold me liable for that. 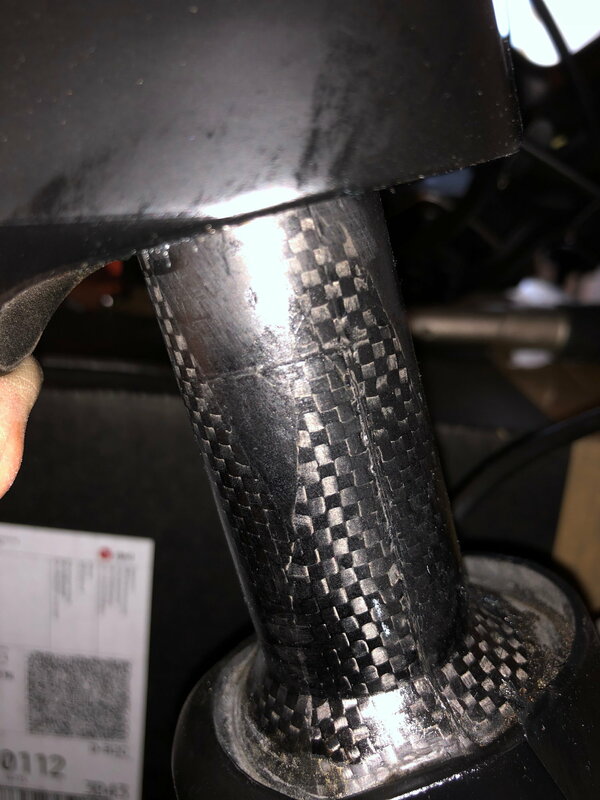 email the maker with the pics....best practice or even better yet if you have a good bike shop in the area have them check it out. They should know what is go/no go wear. Canyon says that the condition is so as it should be: absolutely normal! That deep cross sections are normal, they come from the process of "baking" (or "cooking"?) of the fork in the chimney (is that the right word?!). So what was Canyon's response to no fork race? That alone would be a cause of concern going forward. 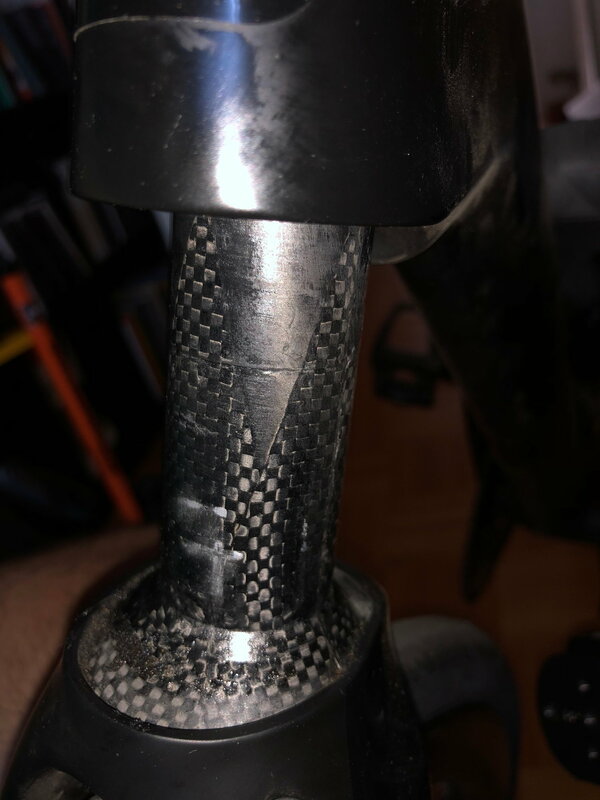 Obviously the headset has a sealed bearing so it is not like there are ball bearings digging into the fork flange, but I wouldn't continue to ride it that way. Think about it... if a race wasn't needed on a carbon fork, it wouldn't be needed on any other fork. Sorry, but I don't understand: what do you mean with "to no fork race"? What does "race" mean in this context? Many carbon forks don't have a metal race. This isn't weird. Well I learned something new today. My steel fork needs a crown race/baseplate/conical spacer (pick one), but a plastic fork doesn't. Cartridge bearings have built in races. Understand. 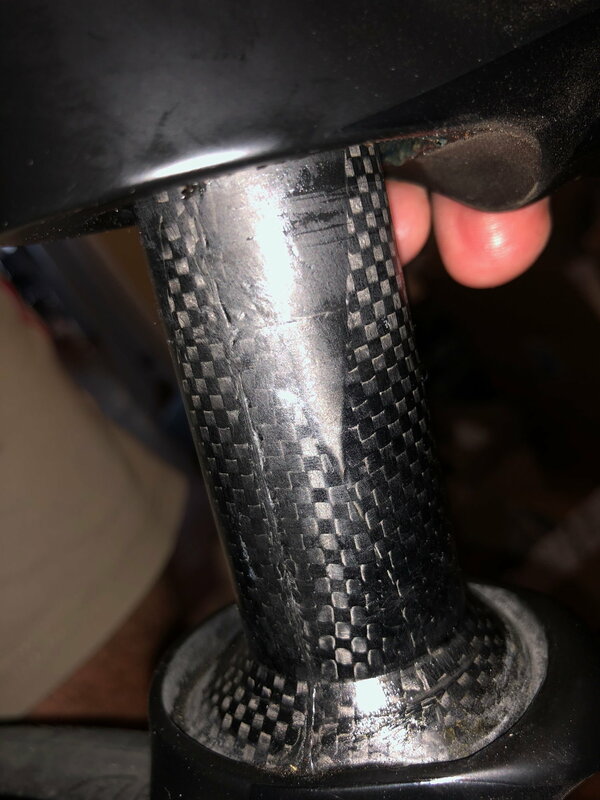 The one's I've installed, on mountain bikes, have a base plate, or crown race as Cane Creek identifies it... even though it is not a bearing surface.